Today in this article i will tell you “How To Run Programs Without Installing Them In Windows“. Isn’t it sounds cool? Obviously it sounds good that running program without installing. Millions of peoples are using windows in the world on their PC or Laptop, because it is user friendly and good operating system. But whenever a user needs to run any software on their windows PC, they need to install it first. After installing the program, it is automatically loaded into the memory. These programs consume RAM(Random Access Memory) to run in background, although if you are not using that program but it will consume your PC’S RAM to stay active in background. Every users needs many software into their PC or Laptop for daily using and that is why they need to install them for using daily. But these softwares which are loaded into your PC’s memory, will slow down your PC by staying active in background. For getting rid of slowing down your PC, i have a cool trick for you by which you can run programs without installing them in windows. 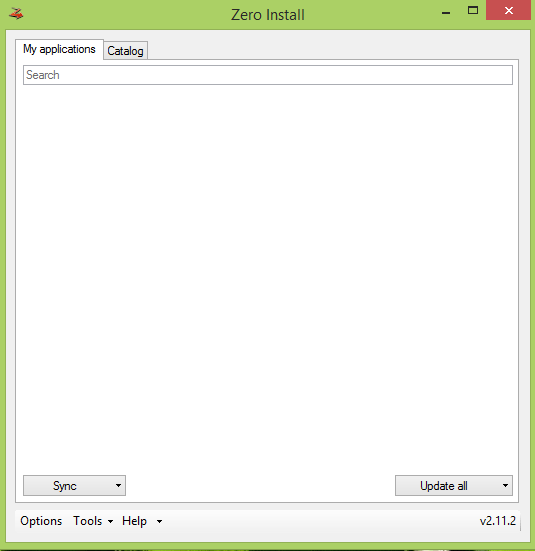 For using program without installation, we will use a software “Zero Install“. By which you will be easily able to run windows programs without installing them, so let’s see how the software works. 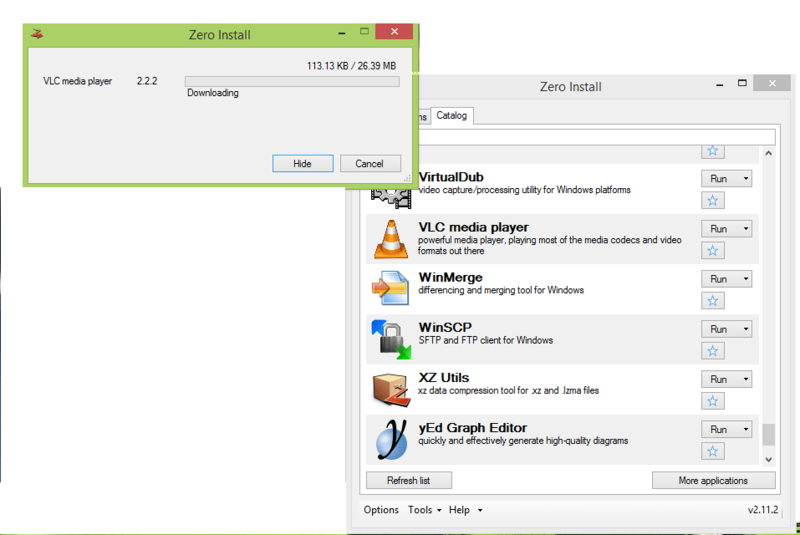 1.First of all you will need to download and install the “Zero Install” software into your Windows PC or Laptop. 2. Now after installing, open it and here it will show you “my applications” on main tab and another tab is about catalog. You will need click on catalog tab now. 3. 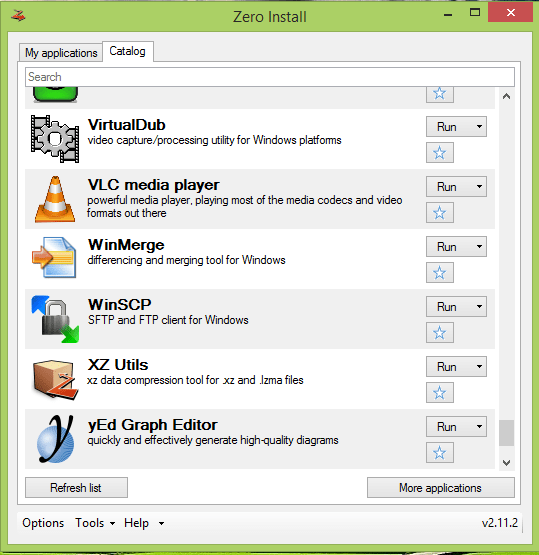 Here you will see all the applications, which can run without installation using zero install. 4. If you don’t see your desired application in the list, then you can click on more apps and enter a keyword for your search. Such as if you want to run chrome web browser, then you can type chrome in search box and it will appear if it would be run using zero install. 5. When you find your application which you want to run without installation, now you just need to click on Run it. 6. Let’s assume if you want to run VLC media player using zero installer, then you can click on run option and it will take sometime time to load into zero installer. 7. After successfully downloading, you can run the application easily without physically install it into your PC/Laptop. 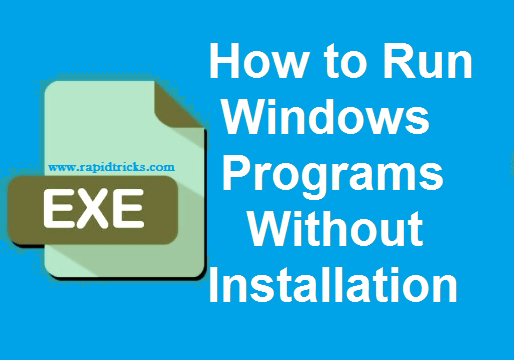 So that is how you can run program without installation into your windows PC Laptop, by using zero install software in your PC. Zero install will help you to save memory of your PC and your PC will not slow down due to heavy loads of the applications in the RAM. We will recommend you to use zero install software for running small application into your PC, so your PC will be free from extra consumption of random access memory. If you like this article then please don’t forget to share it with others, and tell them how you are utilizing this awesome program for running applications on your system. If you have any query or facing any difficulty in using the zero install, then feel free to tell us in comment section below. We want to hear your feedback about our all tutorials and we need your support for providing continues cool details tips&tricks. Stay connected with us for more cool tips&tricks, you can join us on facebook or twitter to get instant updates in news feeds.